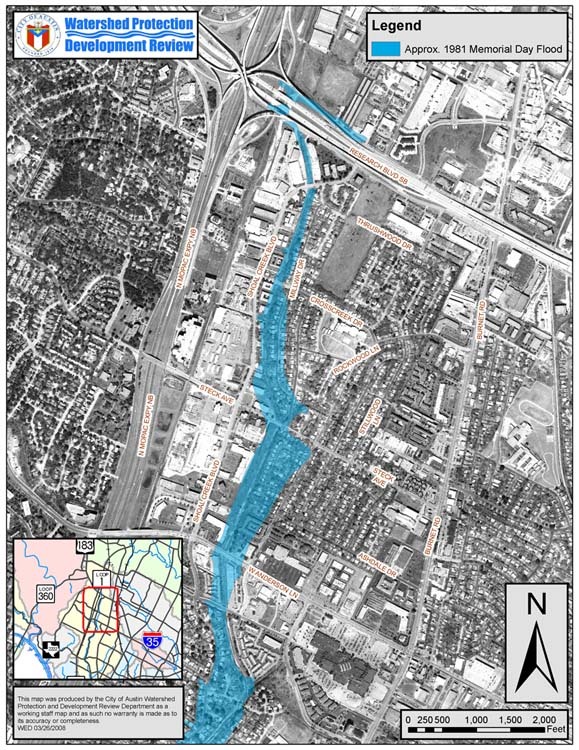 With Shoal Creek running through our neighborhood along Millway, across Steck Avenue and along Vinewood, we are keenly aware of the possibility of flooding. FEMA provides floodplain maps which indicate the projected extent of a 50 and 100 year flood event. This gives homeowners as well as insurance companies an idea of how likely your house will flood. Some insurance companies require you to have flood insurance depending on your home’s proximity to the 50 or 100 year floodplains. Periodically, FEMA updates the floodplain maps to account for new developments in the surrounding areas. 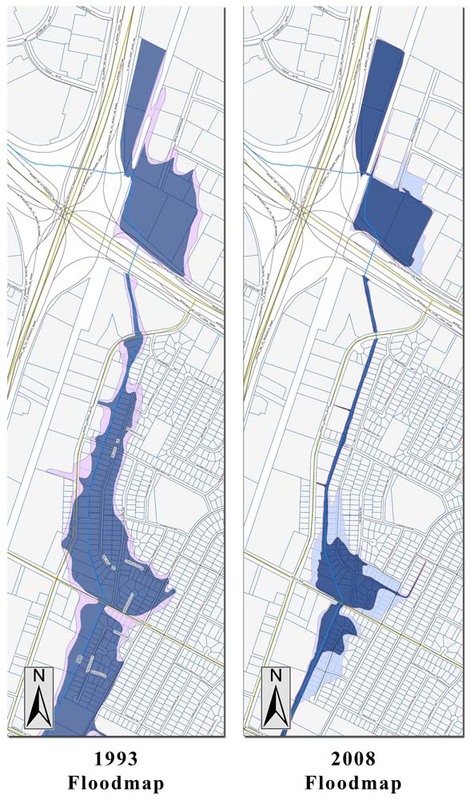 Below is a map showing the 1993 and the current 2008 floodplain maps. You can see that the work performed by the City of Austin as well as the development of the Shops at Arbor Walk have had a profound effect on our floodplain. The addition of the large retention pond just north of 183 has significantly reduced the floodplain along the north Shoal Creek area along Millway. We still have a bottleneck at the bridge over Steck Avenue which leads to higher flood possibilities of houses just north and south of this bridge. For more information about the city’s floodplain changes, visit the city’s floodplain map website. This storm event will always be remembered as the “Memorial Day Flood” which drowned 13 people and caused $36 million in damages. This short-duration storm with intense rainfall hit many of Austin’s urban creeks: Shoal, Walnut, Little Walnut, Bee, and Waller creeks. Shoal Creek normally flows at 90 gallons per minute, but peaked during this flood at 6 million gallons per minute! Some areas received over 10 inches of rain in four hours.